Come join us this Friday at Guardian Plus(Takashimaya S.C.) for our exclusive in-store event from 5pm - 10pm! & redeem full-sized products with minimum nett spent! Need advice? Our beauty consultant will there to assist you! Enjoy "something" specially planned just for you this weekend at our Tampines 1 outlet! Ps: You won't want to miss the attractive deals! 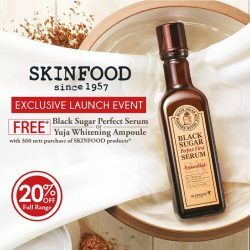 Redeem your FREE Black Sugar Perfect First Serum (worth $49.90) or Yuja Water C Whitening Ampoule (worth $54.50) this weekend at Skinfood's Exclusive Launch Event at Guardian! 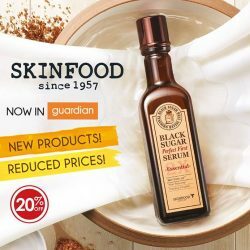 Skinfood has arrived in Guardian with exclusive new product ranges and reduced prices! 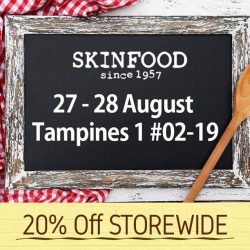 Enjoy 20% off regular prices on all Skinfood items only at participating Guardian outlets from now till 10 August!